Orthopedic surgeon, Steven Sanders M.D., specializes in joint replacement, general orthopedics and sports medicine services. Whether facing hip pain, shoulder injury or knee pain, Dr. Sanders and our highly-qualified orthopedic team delivers quality results. Our goal is to help each patient heal and recover so that they might regain their ability to perform daily routines. Through the use of advanced techniques and state-of-the-art medical technology, including anterior approach hip replacement, we are able to assist our patients with joint replacement, orthopedics and sports medicine care. 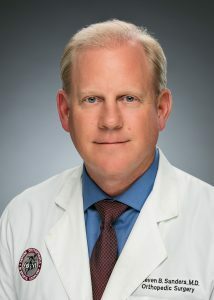 Dr. Sanders is a board-certified orthopedic surgeon who has years of expertise in joint replacement care and is known for being one of the few surgeons who can perform the anterior approach hip replacement technique. Our clinics utilize the latest medical technologies, allowing us to offer better treatment options and comprehensive hip pain care. Patients from Southlake, Keller, Trophy Club, Irving and surrounding cities come to Dr. Sanders for shoulder, hip and knee conditions, and treatment. Keith shares his amazing story. Caring for your health is our primary concern. Guided by Dr. Sanders, our dedicated team of medical professionals are able to provide excellence in healthcare while offering both non-surgical and surgical treatment options. Our highly-skilled team has the experience and expertise to properly diagnose and treat a variety of musculoskeletal conditions. It is our goal to not only meet but exceed the expectations of our patients and referring physicians. Dr. Sanders is a member of Precision Orthopedics & Sports Medicine, an orthopedic group specializing in arthroscopy and sports medicine, fracture care, total joint replacement and complex joint reconstruction, hand surgery, foot surgery, and treatment of spinal disorders. Steven Sanders is accepting new patients. He has two conveniently located clinics, one in in Southlake, TX, and the other in Irving, TX. If you have questions about our clinics or are wanting to schedule a consultation, call our Irving clinic at (469) 297-2663 or our Southlake clinic at (817) 203-2663. Dr. Sanders was professional and informative. He took the time to explain the procedure we were discussing, all the pros and cons and alternatives. Dr. Steven Sanders was wonderful. He listened to my concerns patiently and was able to recommend several options for treatment.